Did you know that August 4th is National Chocolate Chip Day? Sounds like a holiday I want to celebrate. In fact, we ARE celebrating! 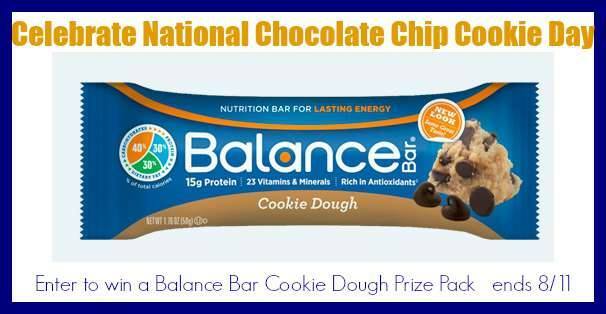 Balance Bars has a delicious Cookie Dough Bar and YOU get the chance to win a Prize Pack filled with these delicious bars! My favorite way to enjoy chocolate chips is by melting them down and dipping in homemade peanut butter balls for Buckeyes. My favorite way to enjoy Chocolate Chips is definitely in Cookie Dough! Chocolate chips are good in the coffee bean grinder, then toast bread with butter, put the chocolate chip shavings on that. Yum! Chocolate sandwich. Love my chocolate chips in cookies! My favorite way to enjoy chocolate chips is in cookies or on ice cream. I like them in cookies. My favorite way to enjoy Chocolate Chips is in brownies. I like chocolate chips in homemade sugar-free cookies. Thanks for the giveaway. I love chocolate chips in muffins the best. I love enjoying chocolate chips melted over fruit! I like my chocolate chips in cookie dough. I like chocolate chips in cookies, like cowboy cookies.